To me, oatmeal was a boring, tasteless breakfast that was cooked in a hurry. It was base level sustenance. So it wasn’t until I was grown and had children of my own that I discovered how truly delicious oatmeal can be. The trick, I’ve learned is to completely avoid that cardboard can and go for old-fashioned rolled oats. There are lots of options abound. You’ll find steel-cut, Irish, and Scottish rolled-oats. As long as your oats are rolled you’ve got the right ones. You should know rolled oats don’t cook nearly as quickly as the brand with “the man in the Quaker garb” on the cover. These oats take their time getting ready. But be patient and your rewards will be plentiful. So we know oatmeal is already healthy. 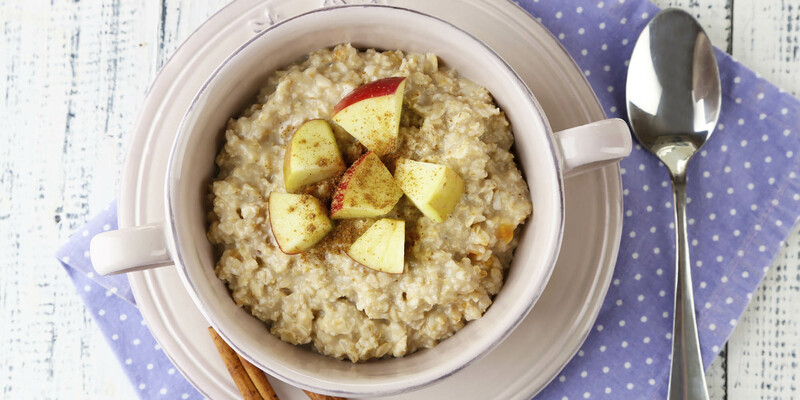 In our recipe for the ideal Apple Cinnamon Protein Oatmeal, we’ve added whey protein powder and flax seeds. This bumps up the protein factor, which can help you stay fuller for longer. Add in the apple pie spices of cinnamon, clove, and ginger, and this becomes the perfect fall breakfast. If you’ve fallen in love with oatmeal like I have. 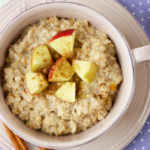 Then you have to try our Holiday Spice Oatmeal and our Slow Cooker Banana Bread Oatmeal recipes. They are the perfect additions to your breakfast repertoire. Love the flavor of apple cinnamon? Try it in this healthy protein-loaded oatmeal! Bring water to boil in medium saucepan over medium heat. Add oats; cook over medium-low heat, stirring frequently, for 3 to 5 minutes. Remove from heat. Add apple, cinnamon, cloves, ginger, and honey; mix well. Let sit, covered, for 10 minutes. If oatmeal is not hot enough, heat over medium heat for 2 to 3 minutes, stirring frequently. Add whey protein powder and flax seed meal; mix well. Divide evenly between two serving bowls.